The rains that were forecast to show up came and delivered. 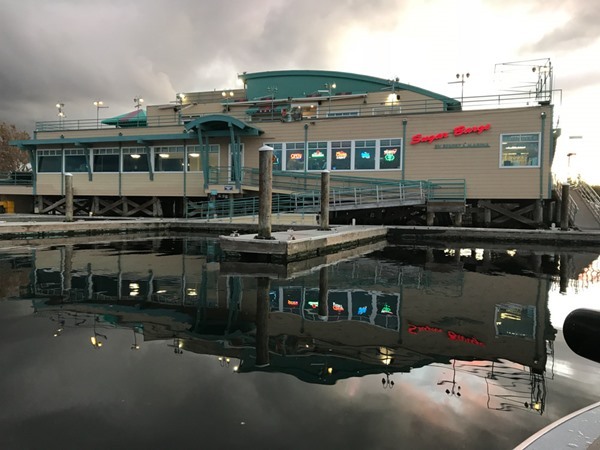 All systems on California's North Coast saw significant rises over the weekend and the roller coaster continues with more wet weather on tap. With so many variables in weather and flows finding the perfect conditions can be fleeting. You can study graphs and projected rises compared to rainfall percentages until the cows come home. Your best bet is to get out when you can and forget the forecast. The fishing has been amazing at times, and slow during others, but for swinging flies that's par for the course. All it takes is one. 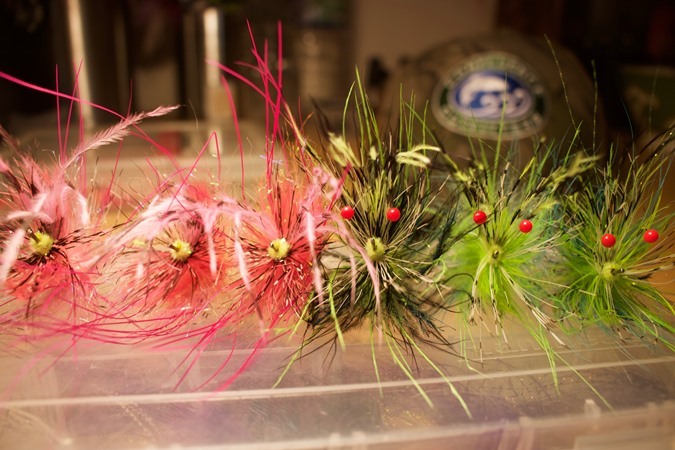 I'm looking forward to transitioning into winter steelhead in the coming weeks. 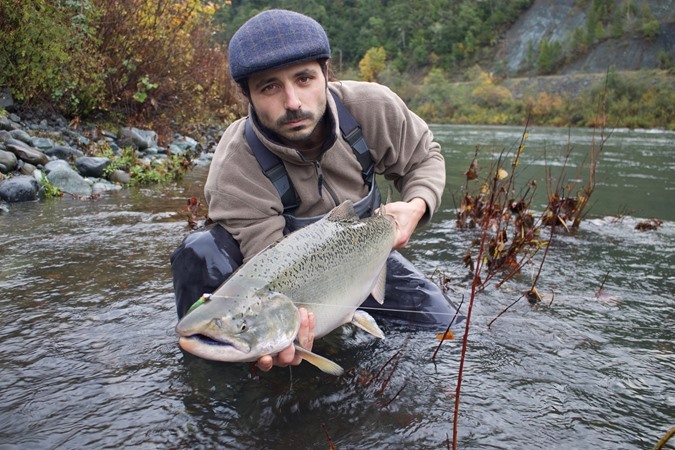 They're already starting to show up on the coast with the runs of salmon. Usually Thanksgiving is the unofficial start of the season, and with this next big push of rain it looks like it'll start off with a bang! A freshly minted coastal king. Sometimes it really is that simple. Pink or Chartreuse? A beautiful hen on the coast. The Diablo Valley Fly Fishers are here and I had the pleasure of guiding Rob and Rich. We received a fair amount of rain yesterday, so the flows have come up a little more and the color is ideal. We did well today. The river was crowded, so finding water is the challenge. Rich started the day by landing a nice hatchery male. Within a few minutes, Rob followed up landing two more nice hatchery fish and then ended up on the losing end after a brief encounter. The extended forecast is calling for a few nice days, but then we have another system moving in that looks to bring some significant rainfall early next week. 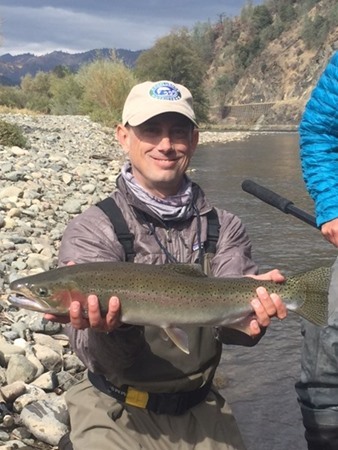 Rich with a really nice hatchery steelhead! Rob with his nicest fish of the day! I just got back from the 2017 Pro Delta Days event put on by John Sherman and the crew at Simms. It was an excellent event, very well organized and we also had some great weather. I was joined by fellow guides Randy Hamann and Brian Kohlman. None of us had fished the delta before so we had very low expectations for our fishing success. Our first two days were really good and then our luck ran out on Sunday. 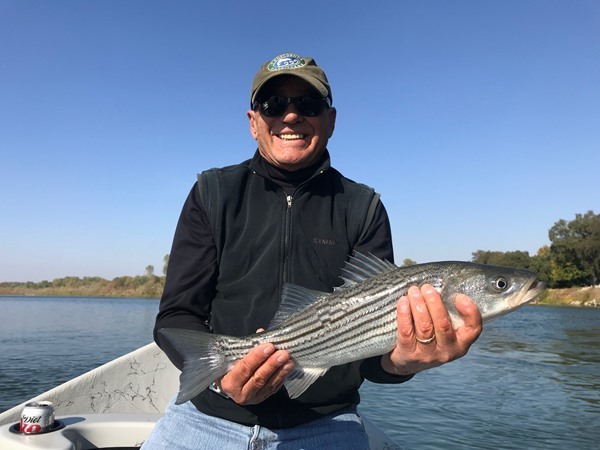 We landed a lot of schoolie stripers up to 4 pounds, mainly casting our streamers against rip-rap banks. It was pretty cool to see bass boats that go 70mph, even if we were not in one! 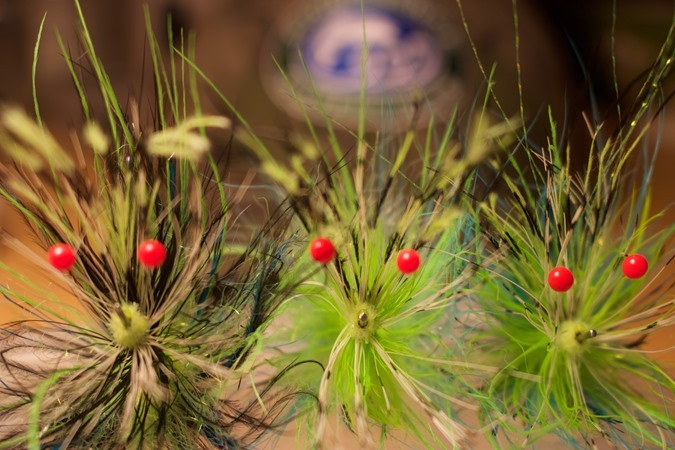 It was also great to see so many of our friends from within the fly fishing industry. We're already planning our next trip to this intriguing fishery. 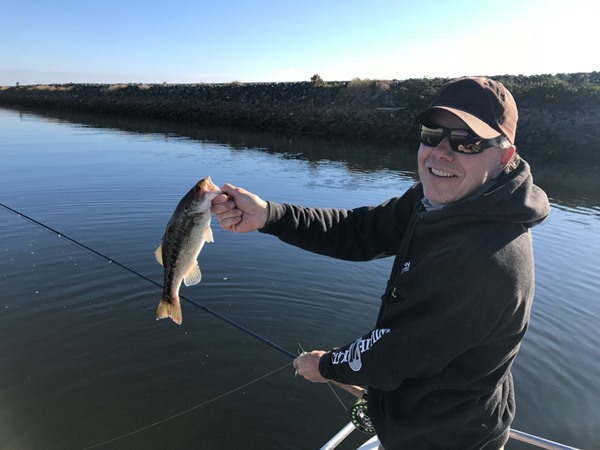 Randy with our best black bass. The Trinity is really starting to get a lot of pressure now, but the fishing remains good. With the recent rains, the flows have come up a bit and we have more rain in store this week. The river is expected to come up some more, but will remain very fishable. I'm hoping this rain will trigger a new batch of fish to move into the upper river. Bob with a nice hatchery buck! Chartreuse is hard to beat when it comes to targeting fresh Kings. I had a really fun day with Phil and Lori. 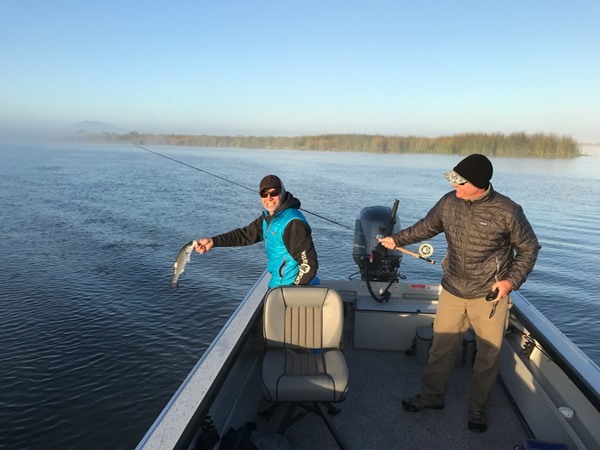 The river had dropped to 6,000 cfs early this morning, but the fishing was consistent in many areas, and spotty in others. Small nymphs have been the most productive my past few trips. The A.C.I.D. dam has been removed and the flows are scheduled to drop to the low 5,000's this week. I spent the day swinging flies with Jeff and Shane from the Golden Gate Angling and Casting Club. Jeff had one brief hook-up and a few solid bumps while swinging. Shane hooked one nice fish while nymphing, but it managed to leave us empty handed as well. 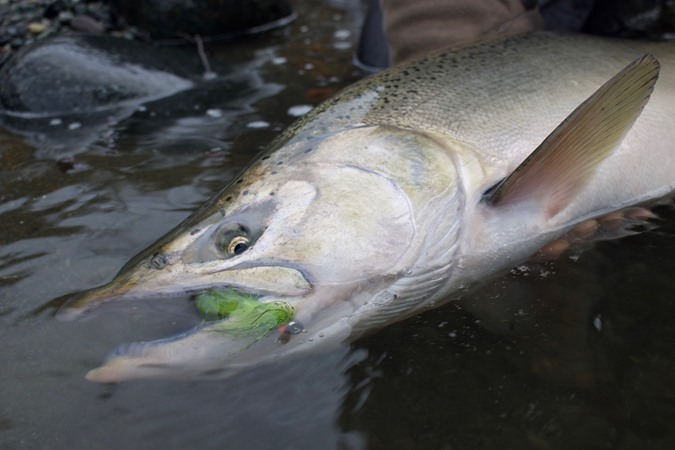 There are plenty of steelhead in the system and with the upcoming rain, conditions should definitely improve! The word is out, so crowded conditions should be expected. The Trinity continues to produce some really nice fish. It has gotten very busy in the past few days, so the fish are seeing a lot more pressure. 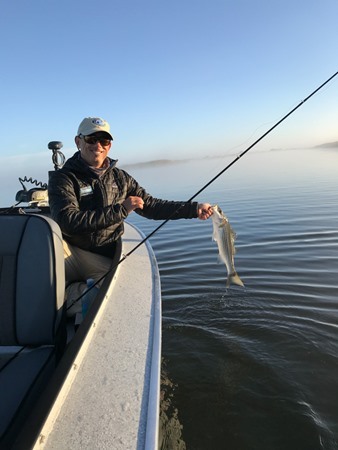 Today was the first day of the Golden Gate Angling and Casting Club's annual trip. Joe landed a very nice half-pounder early on, and he and Kevin fished hard all day. Later in the day Joe hooked into a very nice hatchery buck that gave him quite a fight. We received a little yesterday and last night, so the river has come up a little. 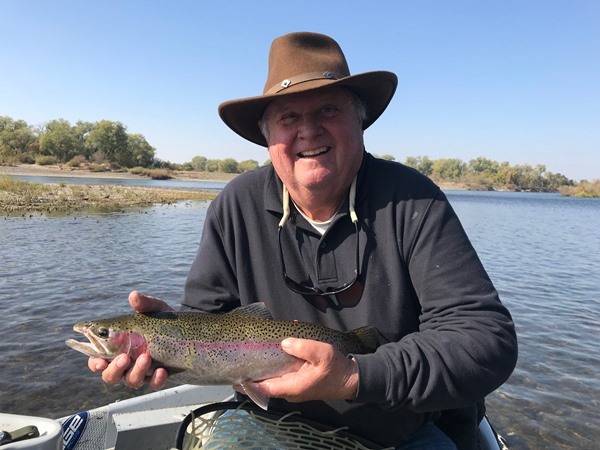 We have more rain coming our way beginning Wednesday, so that should trigger some fish to move up river and the water levels should come up a bit - hopefully. 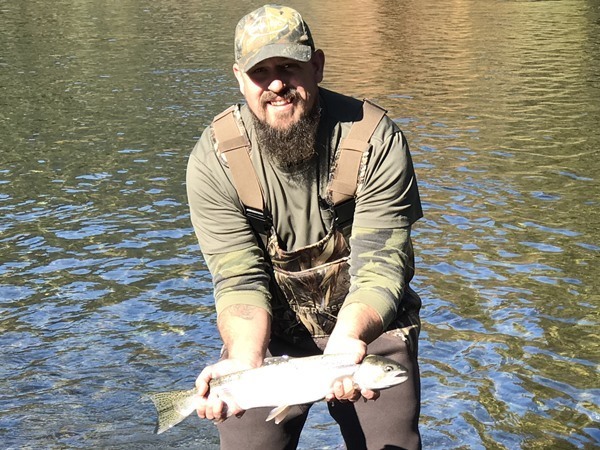 It's steelhead time! 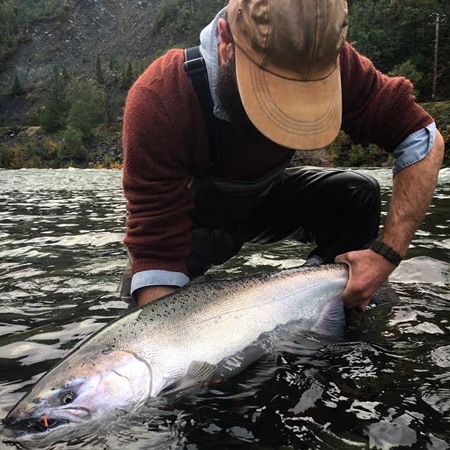 The Steelheading on the Trinity has been ranging from Fair to Great depending on pressure, weather and luck of the draw...in other words Steelheading on the Trinity is in full swing. 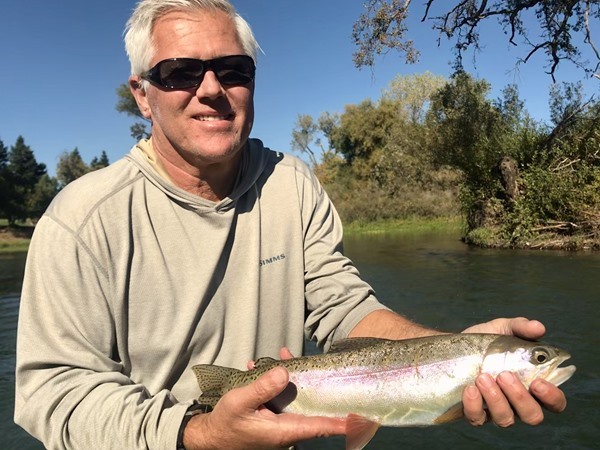 I've been bouncing around avoiding crowds with mixed results, good news is there seems to be a fair number of Steelhead in the system from top to bottom with new Steelhead still comming through the weir in Willow Creek. I've seen a good number of Chinook on Redds mid-river, which I haven't seen the past couple of Seasons, a very good sign for future runs ! I'll be guiding Spey trips on the Trinity through mid January, 1/2 day trips mid December through mid January last Season where pretty popular, hitting the warmest part of the day. Tight Lines ! I just finished up a couple really fun days with guests Bill and John. We fished from Anderson down and saw one other drift boat in two days. 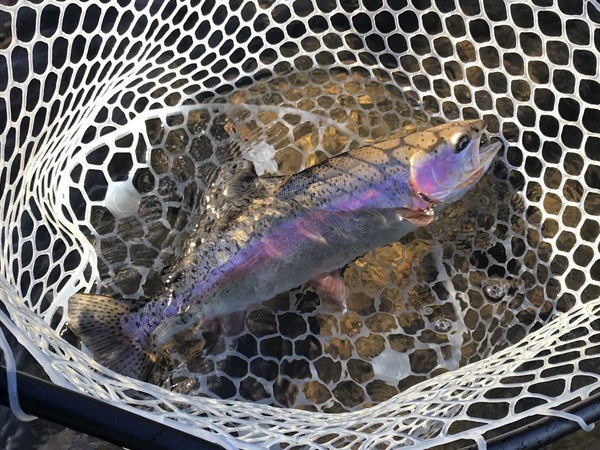 On day one we hooked good numbers of trout, landed a nice steelhead (twice!) plus a nice striper. 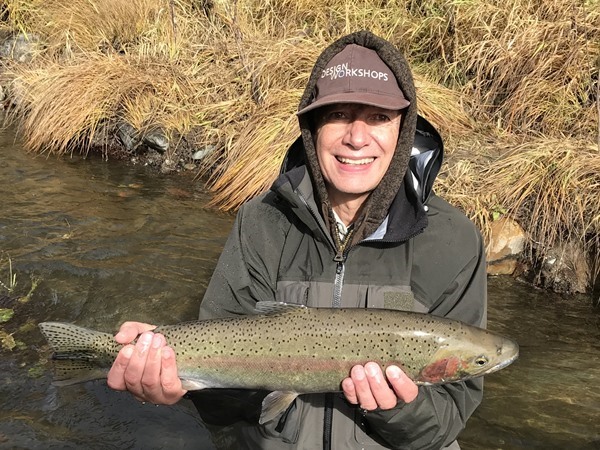 Today the trout fishing was quite a bit slower and we got blown around a lot by the wind, but John landed another really nice steelhead. 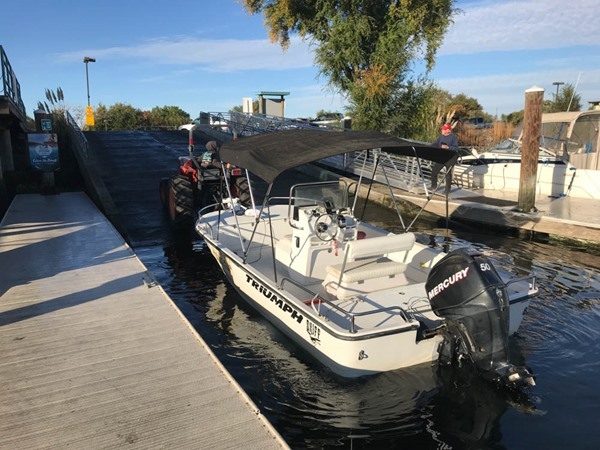 We enjoyed two beautiful fall days on a very quiet river. 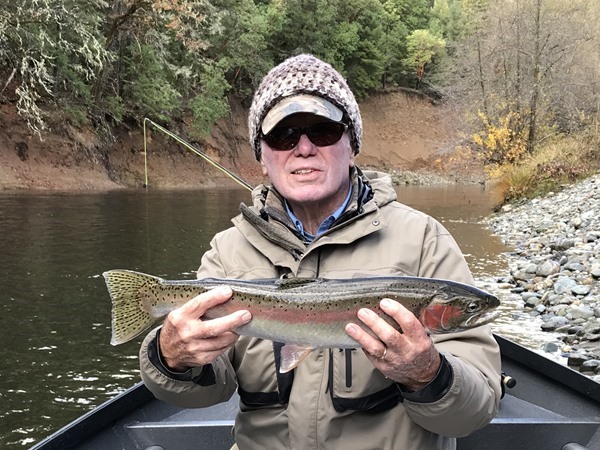 John caught this steelhead twice! I had the opportunity to guide Jeremy and Phil on their very first fly fishing trip the past two days. The weather was ideal - and today was possibly the last warm day we'll see this season. There are fish moving through the system and they are eating bugs. Our first day, Jeremy landed one nice hatchery fish and lost another nice half-pounder. Today, Phil hooked two really nice fish, but wasn't able to get them to net. 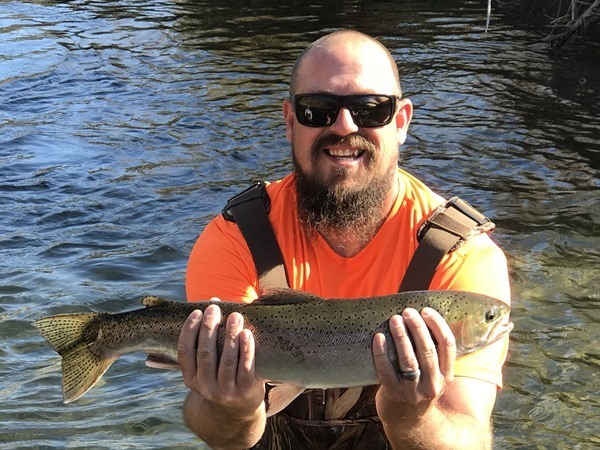 Jeremy landed one very nice native steelhead and was super stoked! Looks like we have some rain headed our way this weekend! That should improve fishing and will definitely help us float through this skinny water. 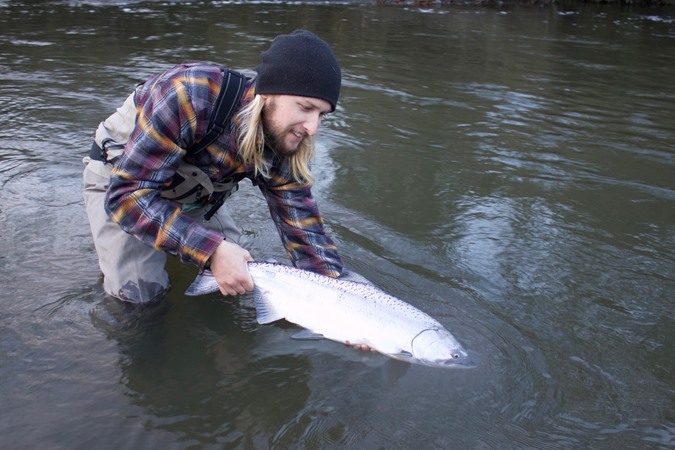 The steelhead are coming, now is the time to book your fall/winter steelhead trip! Recently took clients Martin and Steve on a two location trip in Northern California. We spent the first day on the Lower Sac with mixed results. We had our chances at some fish but just couldn't seem to make much happen. Day 2 was a day spent on the Feather River. 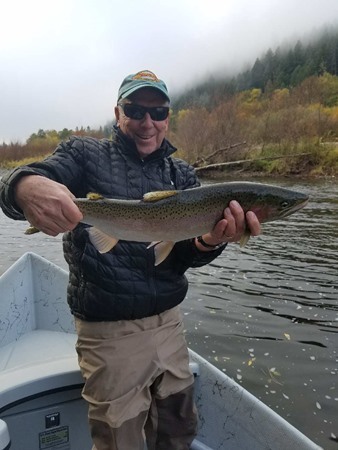 We had a great time exploring the "new look" low flow section of the river and boated some nice hatchery steelhead, a super fun wild buck, and even a fair hooked salmon. 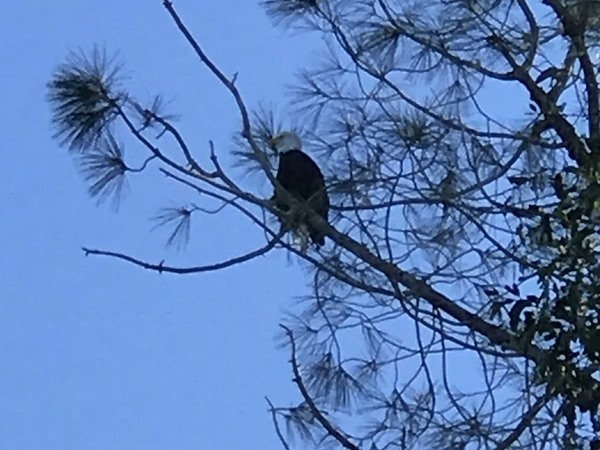 Weather was gorgeous and I was encouraged by the results on the Feather as so much has changed since all of the ordeals from laster winter. 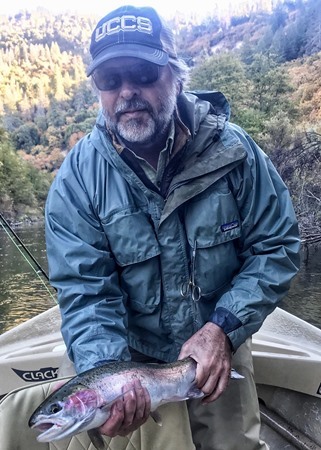 Steve with his very first steelhead. I guided Tom and Judy today and it was a fun day! The fish were super grabby, but we struggled getting them to net. Both promised to improve their landing percentage next time! We hooked a few on eggs, but small nymphs (caddis and mayfly) have been the most productive the past few days. I guided my very good client Pat the past two days. Yesterday was very slow. She hooked into a handful of fish, but there were long periods between fish. Today was much better. We had a few stretches without fish, but by the end she had a very good day! 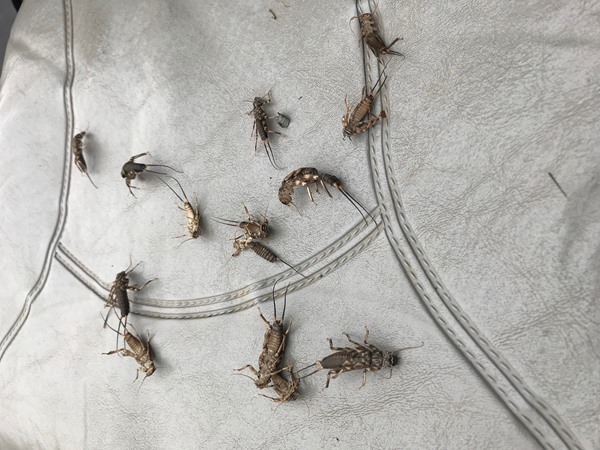 I'm seeing some great mayfly and caddisfly hatches, and it is late October - so the boat hatch is in full swing. 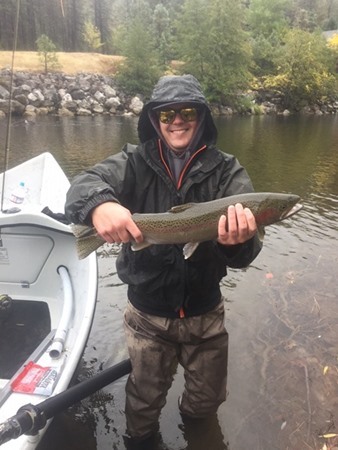 Had the pleasure of guiding Jon + Chet from Ventura on the LS today- (for us) the fish were into egg imitations in the morning and turned onto nymphs in the afternoon. 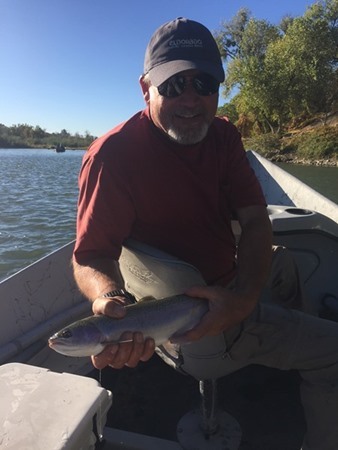 Peter Santley sent me these two photos from yesterday's trip on the Trinity River. He says fishing is picking up and so is the traffic. His clients did very well yesterday, landing multiple fish. 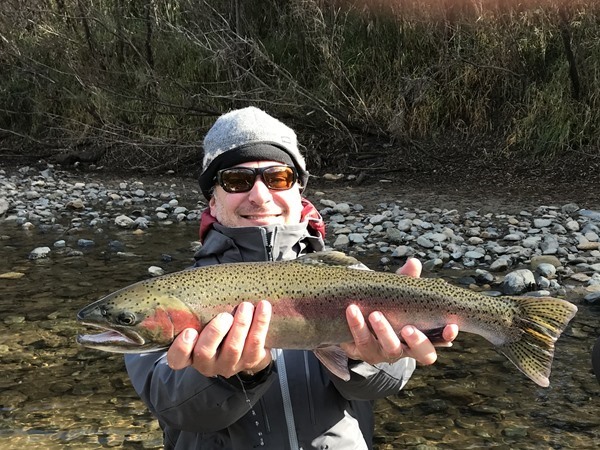 I met Shawn while guiding up in Alaska and was stoked to get him into fish on some local water.Tied into adult steelhead on the swing + nymphing. Encouraged to see several spawning salmon along our drift. Could be great season. 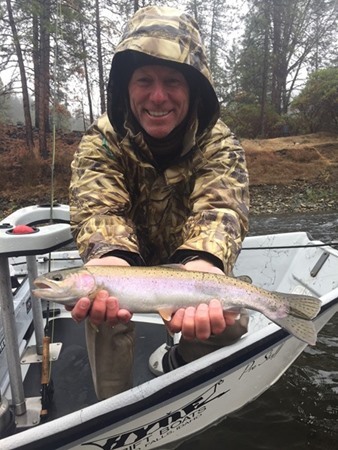 Those of you interested in fishing Opening Day (Dec 9th) at Eagle Canyon now have a 2nd chance to do so! We are conducting a 2nd eBay auction for Opening Day since nobody placed a bid the first time around. What does that mean? 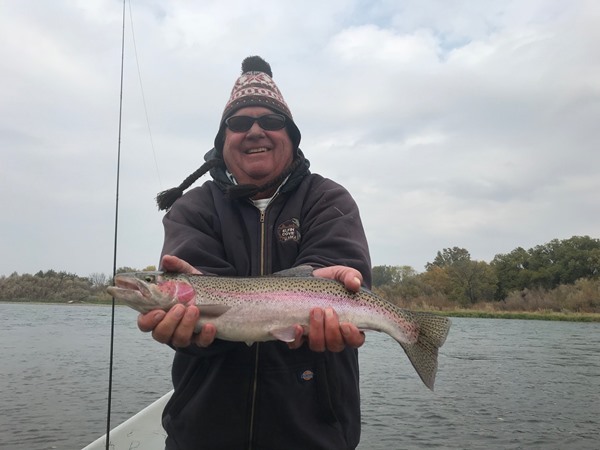 That means that you could have reserved Opening Day for your group for the normal list price of $1160 for a fully-guided day at the lakes for 8 anglers. Now you get one more chance to be the winner. 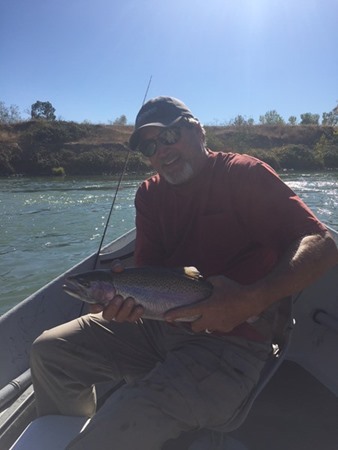 Here is the link to the auction page: https://www.ebay.com/itm/Opening-Day-at-Eagle-Canyon-Private-Fly-Fishing-for-Trout-near-Red-Bluff/122770076974The auction wraps up Monday October 30th at 8am. 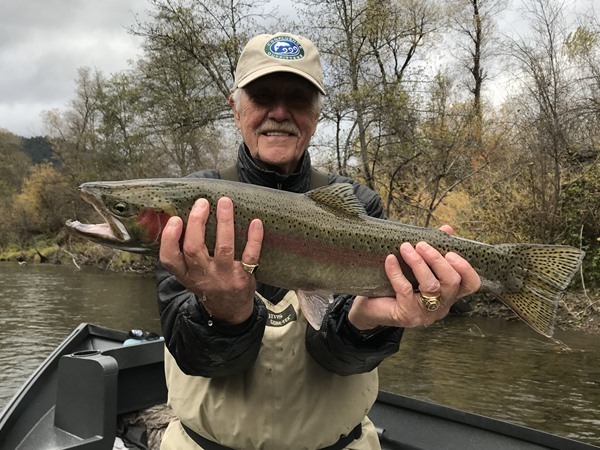 Trinity River: Oct 22, 2017, by Mike: Great Day in the Drizzle! Spent a drizzly but great day on the Trinity with Zach and and my long lost relative Dirk, Ha. We didn't see another boat on our drift all day. The guys fished hard all day and after a slow morning, the fishing really picked up. 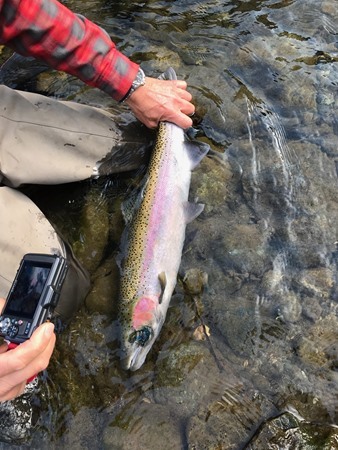 We landed a number of half punders and two nice adult steelhead. Dirk also had long encounters with two really nice big adults that ended in great stories instead of pictures. Had a great day as the laughs were as good as the fishing. One of Dirk's half pounders............but there were others he will be thinking of. 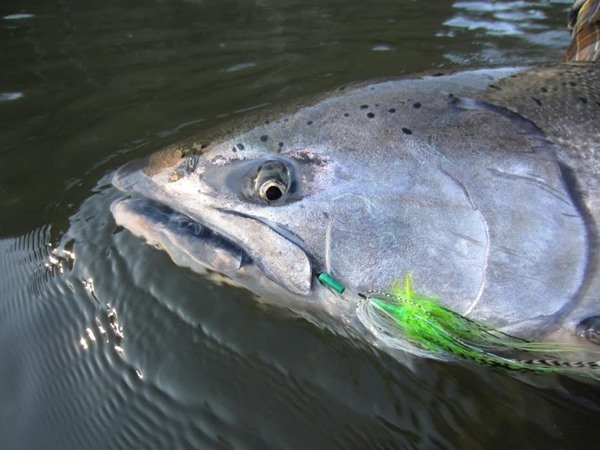 There are steelhead to be caught in the Trinity River. 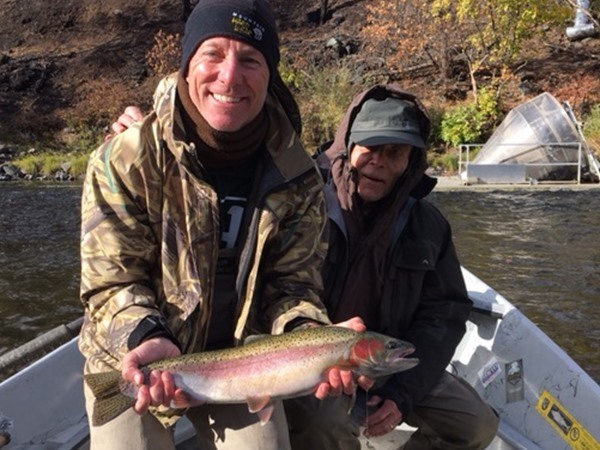 We did a four-boat trip yesterday with results ranging from 1 to 9 hookups per boat on adult steelhead. The river came up a little with the rain on Thursday night, but remained crystal clear. 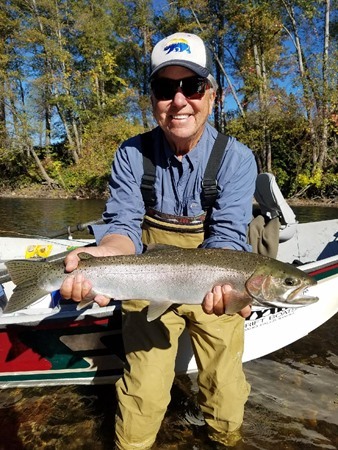 There are thousands of salmon smolts in the river that make fishing difficult in some of the deeper holes, but the adult steelhead seem to be in all of their regular spots. Adult salmon are spawning in many of the shallower riffles. Fishing pressure is light at the moment.